Posts tagged " grandchildren "
If you have avoided children for the past thirty years, you may not be familiar with the classic book, If You Give a Mouse a Cookie. This popular tale, written by Laura Numeroff and illustrated by Felicia Bond, reveals a probable chain of events familiar to us all. If you give a mouse a cookie he might want a glass of milk; the glass of milk might lead to a request for a straw and so on and so forth until the mouse’s desires loop back to requesting another cookie. We’ve all been there, whether with mice, children or ourselves. How many of us have upgraded an outfit, room or website only to discover that the new and improved look compels us to upgrade another and then another item? This just happened to me. I decided to clean out my pantry and discovered a ridiculous amount of salt. I know how this came about – I don’t cook with salt very much yet I buy new boxes of both table and kosher salt (which describes the size of the crystals, not its kosher status) for Passover each year. Since we never finish these containers, they pile up. These days, salt is not an expensive item. Even so, I was reluctant to simply throw it away. I texted my two daughters asking if they wanted salt to make relief maps with their children who are in a homeschool geography club. I should have known better. I got an immediate response saying what a wonderful idea it would be if I would make relief maps with the girls. That of course led to searching for videos on how to actually make the salt dough and finding printable maps of Washington and Maryland, the girls’ respective assignments. I needed to pull out paint and scissors and run to the store for flour as well. Since two of my darling granddaughters were already coming over, they might as well stay for supper so I put up a batch of macaroni and cheese which, incidentally, called for a pinch of salt. I may not be crazy about mice, but if you give a retired homeschooling mother some salt, she will think of an educational project which will lead to enjoying her blessings. Wishing you all a blessed Thanksgiving with your loved ones. The past few weeks have been a true period of blessing for our family. Just over a week ago our daughter, Rachelle, and her husband, Zev, presented us with an enchanting granddaughter. While my husband and I dislike being apart, for the second time in less than a month we are miles from each other (see previous entries, Graternity Leave, and Eat, Pray, Eat, Love, Eat.). I am helping with a newborn in New Jersey while my husband is at home, focused on our work. Jewish girls get named when their fathers are called up in public during the reading of the Torah. Giving a child a name is one of the first responsibilities parents have, and our children took that responsibility most seriously. This past Shabbat, the baby was given the name, Aliza Malya. Aliza means ‘joyous’ in Hebrew and carries the meaning of Zev’s grandmother’s name. 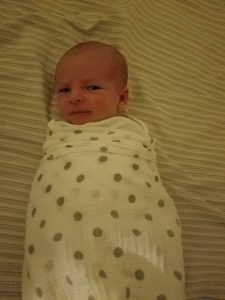 Zev knew his grandmother well and in naming their daughter after her, he and Rachelle want to bestow on her the delighted way her namesake approached life. Malya was my husband’s mother, and Rachelle was gifted with years of knowing her grandmother as well. My mother-in-law was a woman with qualities of strength, leadership and faith – along with a marvelous sense of humor. Bearing the names of these two women is a weighty legacy for a teeny girl. She has yet to find her thumb or sleep through the night. She doesn’t even have a proper belly button. As she passes those milestones and ever so many more, I pray that she will grow into her name and admirably carry on the values her great-grandmothers enthusiastically embraced and the qualities they exemplified. With their names, she has been given a precious gift to accompany her throughout her life. Here is an entitlement program I can support: graternity leave (maternity = mother; paternity = father; graternity = grandparent). I’m not thinking of initiating a lawsuit or picketing corporate America, however I would like to raise social awareness of this option. After a month of Jewish holydays which substantially cut down on available work days, I should be aggressively returning to business. The backlog of unanswered emails and the work needed to get our newest audio CD available for sale are overwhelming. Customer interaction, Musings writing and regular administrative details are all areas which have been sorely neglected. I’m afraid they will continue to be disregarded, or at the very least they won’t get my undivided attention. Our daughter and son-in-law presented us with an enchanting baby boy early Sunday morning a week ago. I am in Jerusalem filling my daughter’s freezer and helping her adjust to her new reality. In theory, I could find time to do some work as well, but I’d rather spend my time staring at the baby as he yawns, squishes his face and gazes around. I am hereby invoking graternity leave. Word crafting runs in our family. My son has pointed out that there is an inclusive word for sisters and brothers – siblings. However, no equivalent exists for nieces and nephews of which, thank God, he has a growing numbers. Hence, his new word – niblings. Longer musings from me will resume shortly. Have you seen those “Where are they now?” notices on your computer? They refer to the cast of a TV show that has been off the air for a while. If you are avoiding work you can spend too many minutes catching up on the lives of people about whom you would otherwise never think. Re-reading the blog post below and noticing that it is almost three years old made me ask the same question, but about women I truly care for and with whom I speak regularly. We are still working. We are still involved with our families. But as the collective number of married children with their own children increases we face a new dilemma. The conflict between home and work is now a multi-generational one.